Because their map is too extreme for Weld County and Colorado. - This measure increases setbacks up to five times the distance of what is currently required. Under the measure, 85-percent of the state would be off limits to new oil and gas development. 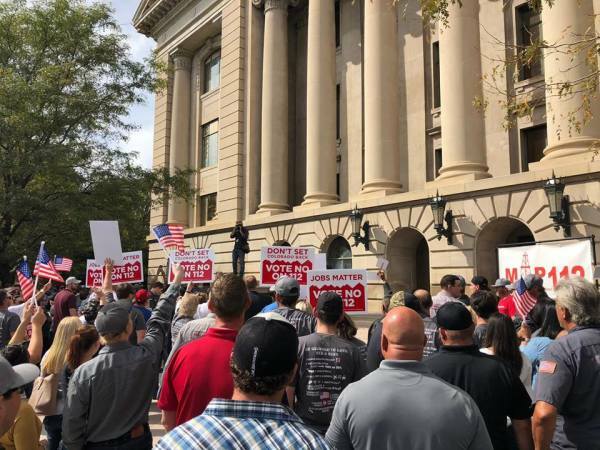 It would eliminate new development in 94-percent of non-federal land in the state’s top five oil and natural gas counties, of which Weld County is the leader. These are COLORADO jobs and would dramatically affect your community, your neighbors, and perhaps even your own family! - Passage of this proposition would result in reductions to state and local tax revenue somewhere between $7 billion and $9 billion over 12 years. This revenue is critical for state and local governments, schools and special districts that pay for everything from new parks to police and fire departments to road improvements. - In recent years, oil and gas production has contributed $839 million to schools. The passage of Proposition 112 would mean these monies would disappear, leaving school districts desperate to raise taxes, eliminate staff, or both. The anti-energy groups pushing this proposition claim it is a health and safety issue. The health and safety of the public is the number one concern of energy producers. - The Oil and Gas industry is ranked in the top ten on the total safety metric among industries tracked by the U.S. Bureau of Labor Statistics. - Larry Wolk, the head of Colorado Department of Health and Environment, has said there is “no credible evidence” showing increased setbacks are any more protective of public health than the current setbacks. - In the last few years, 26 studies - including one from Colorado State University - have found that fracking does not contaminate groundwater. - According to the EPA, from the 1980s to today, the quantity of “Poor Air Quality Days” has decreased from an average of 25 per year to less than 10 per year even as oil and natural gas production has increased six times to what it was 30 years ago. There are many more facts and figures to quote, but they all indicate the same thing: It is clear that Proposition 112 is not about health and safety. It’s a veiled attempt to eliminate oil and natural gas development altogether and doing so would decimate families, businesses and Colorado’s economy. In my quaint neighborhood - Pioneer Ridge in Johnstown - I know several families employed directly by the oil and gas industry. They’re good people. Their kids attend our schools, they eat dinner at Johnstown’s restaurants and shop at Johnstown’s stores. They add to the uniqueness and betterment of the town of which I am so proud to be mayor. I cannot in good conscience sit idly by while anti-energy, radical environmentalists try to force their destructive will on an industry and on families that do so much good for Johnstown. Please join me in lifting your voice to defeat Proposition 112! As a mayor, it’s my job to fight for our citizens and the good of Johnstown. I know other mayors feel the same way about the communities they serve. That’s why in the coming days I will organize Mayors Against Proposition 112 (MAP112). We’ll collectively lift our voices to fight this measure. We’ll hold informational meetings and rallies, walk neighborhoods, and tell those who listen about the devastation this measure would cause in our communities. Please stand with Mayors Against Proposition 112 (MAP112).